- What can these leg wraps be used for? The Protechmasta SilverAid leg wraps use two therapeutic properties to benefit your horse: Protechmasta FIR (Far Infrared) rays, and SilverAid technology – an antimicrobial treatment which uses silver ions to kill bacteria. The combination of FIR therapy and an intelligent antimicrobial treatment means the SilverAid leg wraps are useful for aiding the healing of a wide range of issues, such as pastern dermatitis (mud fever), cracked heels, both new cuts or scratches and infected cuts or scratches, scabbed legs, filled legs, windgalls, tendon, ligament or muscle sprains and strains, lameness, recovery from exercise, and much more. - Are the leg wraps a suitable substitute for medical attention? No. These wraps are intended to supplement and aid established medical treatments, and to heal lower-severity cases. They are not a replacement or substitute for medical advice. Consult your vet if you are unsure. - Where can these leg wraps be worn? These leg wraps are intended for stable use only. When can these leg wraps be worn? Yes – the best place to wear them. No – they do not offer sufficient protection for travelling. - Should I clip my horse’s legs before using the leg wraps? For the SilverAid technology to be fully effective, the intelligent lining must be as close as possible to (ideally in contact with) the affected area of the skin, so feathers should be clipped. - Can I use the leg wraps while using other treatment methods? The SilverAid leg wraps are ideal for supplementing other treatment methods, for example for your horse to wear in the stable overnight while other treatments are used through the day. However, because the SilverAid technology ideally requires being as close as possible to the skin to work, they will not be effective if use at the same time as creams or bandages. - How long does the Protechmasta Infrared technology last for? The Protechmasta Infrared technology comes from tiny ceramic particles which fused to the fabric’s yarn during the manufacturing process. This means the technology will not wash out, and will last the lifetime of the product. - How long does the SilverAid technology last for? Like all technical treatments, the SilverAid technology has a finite lifetime. We estimate that the effectiveness of the treatment will start to decrease after 25 washes, but this will vary depending on many factors, such as what the condition it is being used to treat and how severe it is, how dirty they get and how often the wraps are washed, the environmental conditions the wraps are used in, and so on. - How often should I wash the leg wraps? We recommend that washing is kept to a minimum, to preserve the lifespan of the SilverAid technology. We recommend that the wraps are only used when the legs are dry and clean, so they should not get too dirty in normal use. If your horse’s leg is more severe and is exuding (e.g. pus), then they will need to be washed more frequently. - Should I wash my horse’s legs before using the leg wraps? Your horse’s legs should be clean of any dirt or mud and dry before the wraps can be put on. For optimal effectiveness, the fabric of the liner should be in contact with the affected area of skin, with nothing in between. - How should I wash the leg wraps? Before washing the leg wraps, attach the supplied hook-and-loop covers onto the hook-and-loop strips on the removable liners, to protect them. After washing, remove the covers from the hook-and-loop strips to reattach the removable liners to the outer piece. Dry on a washing line. - Will these leg wraps prevent mud fever? These leg wraps are not designed to be worn in the mud as a prevention of mud fever. Furthermore, the SilverAid technology requires clean, dry legs with no obstructions between the liner and skin to work, and mud will cause such an obstruction. 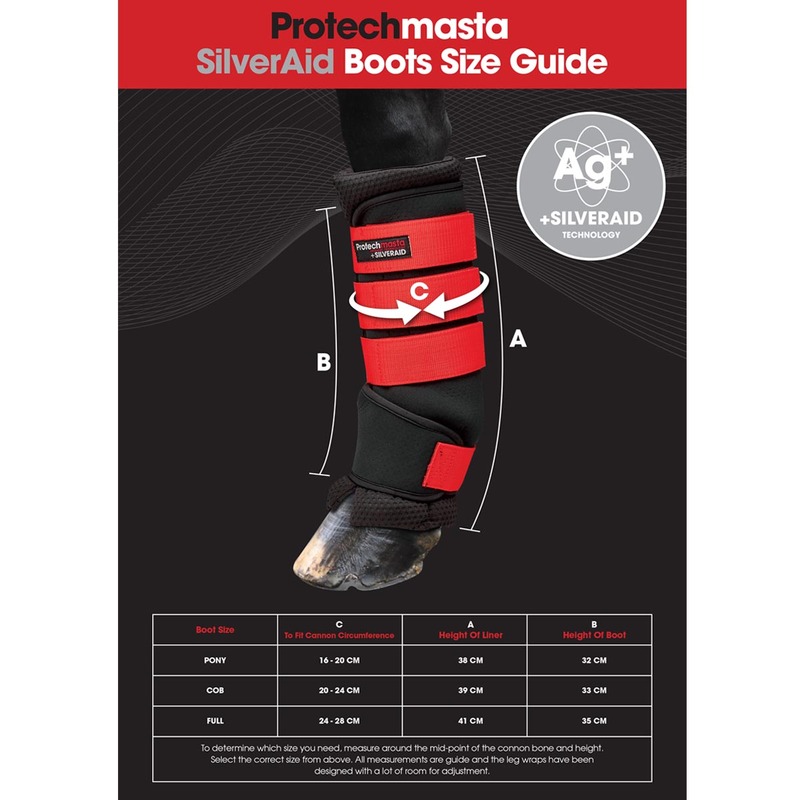 - How are the Protechmasta SilverAid leg wraps different from other leg wraps on the market? The Protechmasta SilverAid leg wraps are unique in the sense that they are the only leg wrap product on the market which utilises both the tried-and-tested Protechmasta FIR (Far Infrared) therapy method and the SilverAid technology – an effective and intelligent antimicrobial treatment which uses silver ions to kill bacteria. - How long is it recommended to leave SilverAid Leg Wraps on for? If your horse is new to Protechmasta start with leaving the boots on for an hour and increase each day. Leaving on overnight for a horse that is stabled is ideal. Use the boots primarily until the infection has healed, being sure to take the pads off and wash them regularly. However you may want to continue use as a preventative to help prevent fungal infections such as Mud Fever returning. - Can I use the use the leg wrap outers without the lining, or the liners without the outer? Both the removable liners and outer pieces of the leg wraps have been designed to be used together, and for maximum effectiveness that is what we recommend.